Linux on Supercomputers | Sólo para Mí! I started by presenting the project of Satoshi Sekiguchi from Japan, who is in charge of ABCI, a supercomputer that pretends to be the top1 in the list of supercomputers around the world. This project is expected to be done in April 18 to help simulations of earthquakes with 130 petaflops of speed in calculations. The top 5 of top500 list: The way supercomputers were measured with the Linpack tool and why Linux have been used in the most powerful supercomputers were also explained. History of supercomputers and techonology relate to were topics during the talk. I have also emphasized the importance of gathering a multidisciplinary group in a supercomputer project or in other parallelized computer architecture. Thanks to the organizers for contacting to do this rewarding talk. Linux is important for scientific purposes as well as for education in Peru and around the world. 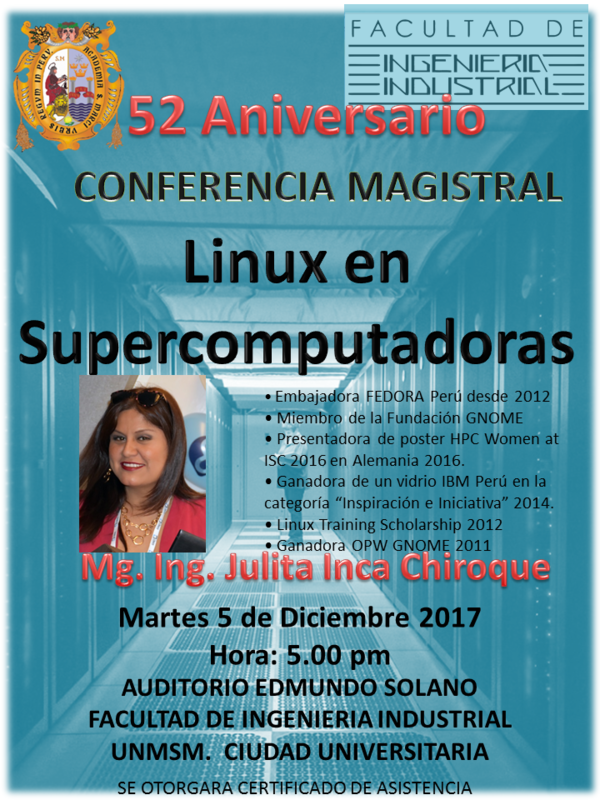 This entry was posted in Education, Events, FEDORA, GNOME, GNU/Linux/Open Source, τεχνολογια :: Technology and tagged ABCI, Facultad de Ingenieria Industrial, Julita Inca, Julita Inca Chiroque, linux, supercomputer talk, supercomputers, top500, UNMSM. Bookmark the permalink.